16-team tournament between qualifying European national teams. Matches held in Poland and Ukraine, this year's host nations. Similar to World Cup in format — a group stage played on a table (like EPL), followed by a knockout stage. Group stage — four groups of four teams. Top two teams advance, bottom two are out. Play each of the other sides in your group (three matches), so there are a possible 9 points to be had on the table (a perfect score). Knockout stage begins June 21, ends with Final on July 1. See chart below for dates/bracket. From Bleacher Report — pretty good write-ups and ranks for all the teams. Ukraine is your patsy. But I Don't Know Any of the Teams! Of course, you'll know the entire, confused, manky England team by heart, no matter who Hodgson starts or sits. English Premiere League being the tip-top, bestest league in the world, where most everyone wants to play. Defenders: Gaël Clichy (Man Citeh), Patrice Evra (Man U), Younès Kaboul (Tottenham), Laurent Koscielny (Arse), Adil Rami (Valencia), Philippe Mexès (AC Milan). Midfielders: Yohan Cabaye (Newcastle), Florent Malouda (Chelski), Samir Nasri (Man Citeh). Forwards: Hatem Ben Arfa (Newcastle), Karim Benzema (Real Madrid), Franck Ribéry (Bayern Munich). You won't recognize anyone on the Czech Republic team... until you see the goalie — Petr Cech from Chelsea (hat!). So, no Clint Dempsey (U.S.) and no Luis Suarez (Uruguay), but still lots of familiar faces/bastiches/divers. Don't think you know anyone on the Italy team? Watch asshat Mario Balotelli (Man Citeh). See? Will Spain make it into the history books? — There is more at stake than the chance to become the first repeat European champions. Spain – the reigning World Cup champions – can also become the first team to claim three international tournaments in a row. Speaking of the GROUP of DEATH — Whenever the draw in a major tournament is announced, a group is slapped with the “Group of Death” label. In this instance, the tag doesn’t do justice to the four unfortunates in Group B! While the FIFA World Rankings should be taken with more than a pinch of one’s favorite seasoning, in this instance they’re instructive. All four teams are currently ranked in the top ten. Denmark, the presumed weak entrant in the group, is currently ranked ninth, with Portugal fifth, the Netherlands fourth, and Germany second. Will the host nations do themselves proud? 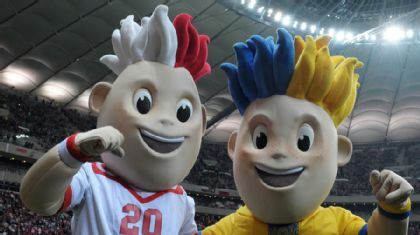 — Poland and Ukraine can’t do any worse than the previous tournament's co-hosts – Switzerland and Austria – neither of whom made it out of the group stage, recording just a win and a draw between them. The good folks at UEFA have done everything in their power to avoid such an embarrassment again: Poland has been drawn into a ridiculously easy group alongside Greece, Russia, and the Czech Republic. the UEFA/McDonald's game looks like the one for us (thanks, Nihilist). Go get registered and poke around; I will get us a league going shortly. That ought to get ya started. Have at you! Re: Euro 2012 — Fantasy + Chat! If anyone drafts English players for their Euro 2012 team, I will say this much: you're very brave (or maybe just stoopid?). I've never felt less optimistic about our national team than I do now. It's not even Roy H's fault: I actually like his appointment (better choice than 'arry "Dog Bank Account" Redknapp IMO), but the players...ugh. Not inspiring. If we leave John Terry at home, I will consider that a victory. My early prediction: the Germans conquer Europe. They're looking strong to me. On a related note: I would love it if Grant Holt got a call up. And just like that.... the nation of Cloudcuckooland was born. Anyone got a snappy name for the league? Only thing I can think of is Greek Gyro 2012. FnG’s Bwing on the Euwos 2012! Er, and, we'll see you in Ukwaine against Fwance! set us up with our league name without realizing it. Go HERE to register and log in. FREE! You're a cwuel, cwuel man. In all seriousness, the Sun really should be shot for that headline. Roy is the most qualified manager we've had in years. Former international experience, turned Switzerland (SWITZERLAND!!!) into an international force, and has won far more silverware than 'arry. I'm glad RH got the job. [FnG] Nihilist wrote: In all seriousness, the Sun really should be shot for that headline. Roy is the most qualified manager we've had in years. This is all true. FnG's Bwing on the Euwos 2012 league is indeed born from the ashes of shame and ruin. I think, despite the qualifications, and given the personnel mess he's been handed (thanks, England's Brave John Terry), there is a prevailing sense that he's going to lead England to a sort of .500 record — win some, lose some. In the end, all to no great effect. Fulham qualified for Europe under him, which is quite an achievement! I also think Tactically Dull is appropriate for our national team. The English game breeds one dimensional players with borderline zero attacking flair. The reason there are so many creative continental players in the Prem is that there are no English creative players worth a damn. Simply put, English players are about 30-40 years behind the times. We're still training as if the days of physical kick-and-rush football at still the way of things, whereas the likes of Germany, Spain and France have pushed on to the next level. We're out of date, out of time, out of ideas and out of players. Successions of continental minded managers have failed with the England team. The Golden Generation turned out to be Fool's Gold, and the successors are even worse. Dull, discplined tactics are about all we can hope to (successfully) utilize right now. Yep, that's what I'm expecting. English international football needs to change at a grass roots level. We're irrelevant right now. Alright! 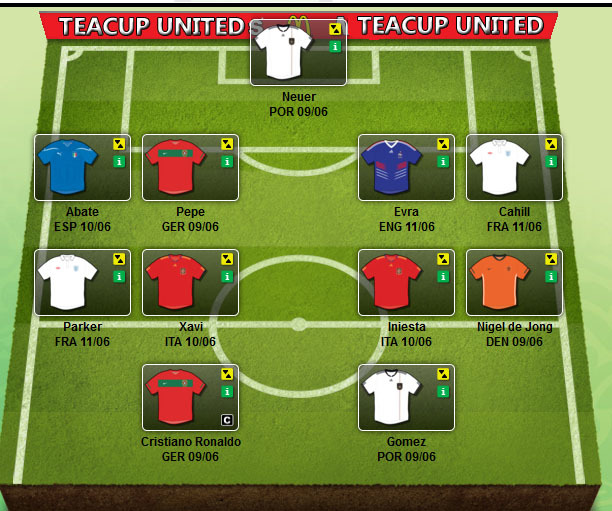 TEACUP UBER ALLES is signed up and has its team set up! Since this isn't the cut-throat Fundesliga (:lol:), I'm going to gladly show off my uberteam. Fear the Teacup International travel squad! Woah, Nigel de Jong? Is he even healthy? while they're upright and running toward him. Don't see the fantasy potential there, but speaking of potential — red card waiting to happen. It's very similar to Barclays, but there are some fundamental differences too. group stage ends, so you're going to be losing doodz at an accelerating rate. the same team — from 2 in the group stage to 12 by the final. the start of the knockout stage. been actually sent off in his match. Hmm, interesting. someone else on your bench. Woot. Auto-subs at the end of the "match day" seem to work the same as FPL. Transfers: Unlimited before Matchday 1. 1 for Matchday 2. 1 for Matchday 3. Unlimited at the start of the knockout stage. 8 for the semi-finals and 4 for the Final. You get one transfer wildcard to play anywhere in the tournament. Also, note that the player lists right now are provisional — subject to change. Looking over the scoring rules, I like that they give defenders points for clearances! That's a huge thing that Barclays FPL was missing, I feel. Clean sheets didn't really tell you the whole story of a team's defense, and because of that you always felt like you had to grab defenders who either really played up along strikers or big beefy ones who joined in on set pieces. It's time — does everyone have their team tweaked out? To keep up with things, check out this funky/cool Interactive Twitter Map by the Guardian. Anyone else sort of wary about selecting doodz from the Group of Death (B)? If those defenses are so great, won't they reduce (somewhat) the offense of your player? My team is done, which means I'll probably replace everyone in it twice in the next 22 hours.